HP enters the race. Will HP's solid implementation and Window's 8 OS make a winner out of the ENVY x2 hybrid? Is it a three horse race? Spectators are watching Microsoft’s Surface challenge the iPad as the two front runners in the coming months, but is the HP ENVY x2 coming up from the sidelines? 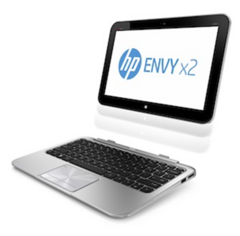 HP’s new ENVY x2 is expected in U.S. stores in December and offers what could be a valuable alternative to the above tablets. While not offering top specs all around it offers a value added package for those who feel they need both a tablet and a proper notebook, but don’t want to hassle with two devices. The display slides in and out from the keyboard with magnetic connectors and is secured by a latch. Marketed as a hybrid, notebook and tablet, the ENVY x2 is taking up where the Asus Transformer Infinity TF700T (10.1-inch display, Android OS) left off. Running Windows 8 the ENVY x2 is hoping to beat the odds. The feature list reads like a tablet; 1.5 pounds, HD touch display, 1.80GHz dual-core Intel® Atom™ Z2760 processor, 1x1 802.11 a/b/g/n/ WLAN multi-band Wi-Fi, Bluetooth® and NFC connectivity, a 1080p HD front-facing HP TrueVision webcam and an 8.0 MP rear facing camera. Wait, it reads like a notebook; the ENVY x2 has a bright 11.6-inch, 1366x768 pixel LED display, up to 64GB of SSD hard drive storage, Beats Audio™ dual speakers, USB ports, full size SD card slot, HDMI port, and for some - the deciding factor - a full-size island-style keyboard complete with a good sized multi-touch enabled trackpad. Together it is 3.1 pounds but, when on the home stretch, the tablet/display can be removed giving maximum mobility and comfort.